This article is about the minivan. For other cars named the Town & Country, see Chrysler Town & Country (1941–1988). The Chrysler Town & Country is a minivan that was manufactured and marketed by Chrysler. It was introduced in 1989 for the 1990 model year. The Chrysler group minivans, which include the Dodge Caravan/Dodge Grand Caravan and included the Plymouth Voyager/Plymouth Grand Voyager/Chrysler Voyager, have ranked as the 13th bestselling automotive nameplates worldwide, with over 12 million sold. After five generations and 27 model year runs, the Town & Country nameplate was discontinued at the end of the 2016 model year run and was replaced by the 2017 model-year Chrysler Pacifica minivan. Originally planned to be introduced as a 1989 model, the Chrysler Town & Country minivan was ultimately introduced as a 1990 model in the Spring 1989. The model was introduced before the 1990 model year Caravans and Voyagers entered production; the Dodge and Plymouth counterparts produced alongside the Town & Country until June 1989 were still 1989 models. Sharing the body of the long-wheelbase (LWB) Grand Voyager/Grand Caravan's Chrysler S platform, the Town & Country was externally distinguished by its chrome waterfall grille, crystal pentastar hood ornament, standard woodgrain applique, grooved lower body cladding (a version of that found on the Caravan ES, slightly extended to compensate for the longer wheelbase), and 15" lace-spoke aluminum wheels. Additionally, Town & Country was only available in two exterior colors, initially in Bright White Clearcoat only; the Black Clearcoat color was added in June 1989. 1991: For its second model year as a minivan, the Chrysler Town & Country is completely redesigned with improved aerodynamics and less sharper corners, and had the 250-watt Chrysler Infinity audio system. 1992: The Town & Country was available with all-wheel drive and integrated child safety seats. Now standard were a driver's side airbag (from August 1991 production) and quad command bucket seating. On the exterior, the Town & Country was available with a vinyl woodgrain delete option. If buyers opted for this, the woodgrain siding was replaced by a gold pinstripe along the beltline. New gold web-design alloy wheels were available. 1993: There were several interior revisions. On the exterior, a stainless steel exhaust system and new available wheel designs greeted buyers for 1993. 1994: Launched in November 1993, a redesigned dashboard and instrument panel was new for 1994. All 1994 Town & Country's were given a passenger's side airbag and knee bolsters. Side door guard beams were installed this year, so that they met 1998 federal side impact standards. Also made standard was a 3.8 L V6 engine. 1995: The fob for the standard remote keyless entry had to be pressed twice within five seconds to prevent accidental opening of the liftgate. 1995 would be the last model year for the K-based Town & Country. A completely new cab-forward styled Town & Country would be introduced in early 1995 as a 1996 model. The 1996 redesign used the Chrysler NS platform and included several industry firsts, including a driver's-side sliding door and a seating management system marketed as Easy Out Roller Seats. With Generation III, the Town & Country was able to cover a wider customer base through new designated trim levels. The premium LXi (and later Limited) included amenities such as pre-programmed driver's seat and mirror, standard leather interior, 8-way power adjustable front seats, Infinity sound system with cassette/CD player, and dual driver/passenger climate control to name a few. An unnamed entry-level model (later redesignated LX) featured fewer amenities in a long-wheelbase (LWB) form. The LX model (later redesignated SX) featured similar content in a short-wheelbase (SWB) form. Both Base and LX models were intended to fill the gap left by the discontinuation of the upscale LX model of the Plymouth Voyager/Grand Voyager which had been discontinued for the third generation. Generation III Town & Countries were the first to feature the historic Chrysler blue ribbon emblem (later incorporated into the winged emblem), which dates from the 1930s. Generation III examples of the Town & Country with only the passenger side sliding door (vs. both rear sliding doors) were only offered for 1996. Car and Driver included the Town & Country on their Ten Best list for 1996 and 1997. 1996: The re-designed Generation III Town & Country is introduced with a short-wheelbase LX model and two long-wheelbase models: an unnamed base model and the LXi. Early minivans had discrete grab handles on the front interior door panels; they were integrated into the front door armrests as a running change during this model year. The 3.8 L engine was standard on the LXi and optional on the LX and Base. 1997: Permanent all-wheel drive arrived as an option for 1997 on long-wheelbase minivans, and all-wheel drive models got 4-wheel disc brakes. Front wheel drive minivans gained a new traction control system, which worked at low speeds to prevent wheel slippage. The rear driver's side sliding door was standard on all 1997 Town & Countries. The short-wheelbase model was redesignated SX, with the LX designation being given to the previously unnamed long-wheelbase base model. 1999: The exterior emblems were changed to use a new font. The middle bench seat was dropped in some models for 1999, and a child seat was now available in one of the two reclining middle-row buckets. Other additions included a small cargo net between the front seats. Another model, the top-of-the-line Limited, was also available for 1999. Among other features of the Limited were a new 3rd row bench that featured higher bucket-like backs on the left and right sides, chrome exterior door handles, and 16" chrome alloy wheels. 2000: The short-wheelbase SX was dropped for 2000, leaving only extended wheelbase models, along with new interior and exterior colors. All models seated seven and had sliding doors on both sides. A new Rear Seat Video entertainment system, with a VCR and 6.4 in display screen, was available as a dealer-installed option. 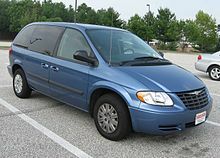 The 1996–2000 Dodge Grand Caravan (twin of the Town & Country) received a "Marginal" rating in the Insurance Institute for Highway Safety's 40 mph offset test. The structural performance and restraints were graded "Acceptable", but the foot injuries were very high. In the U.S. National Highway Traffic Safety Administration (NHTSA) crash tests, it received 4 stars for the driver and front passenger in the frontal-impact. In the side-impact test, it received five stars for the driver, and 3 stars for the rear occupant, and resulted in a fuel leak that could cause a fire hazard. The Town & Country was redesigned for the 2001 model-year, using the Chrysler RS platform and initially only available in long-wheelbase (LWB) form. 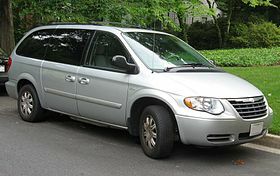 Chrysler's short-wheelbase minivan was instead sold under the Voyager nameplate, which had been transferred to the Chrysler brand in mid-2000 from the Plymouth brand. After 2003, however, the Voyager nameplate was dropped altogether, and short-wheelbase(SWB)models once again joined the Town & Country lineup. 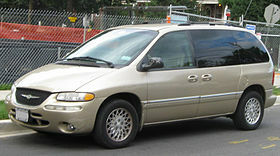 The fourth generation Town & Country went on sale in January 2000 as a 2001 model. The 2005 Town & Country received a mid-cycle refresh including revised exterior styling and a mildly restyled interior. Most notable, was the introduction of Stow'n Go, a system of second and third row seating that folded completely into under-floor compartments. The addition of Stow'n Go resulted in redesigned 2nd and 3rd row seats, as well as the elimination of all-wheel drive. The Stow'n Go system was prominently featured in this model's marketing campaign. For the remainder of this generation, the Town & Country was available in the short-wheelbase base model, and long-wheelbase LX, Touring, and Limited models. As with the pre-refresh model, only the Touring and Limited were sold to consumers in Canada, the LX being restricted to fleets. A driver's side knee airbag was now standard on all models. The front seat-mounted side airbags of previous years were discontinued in favor of side-curtain airbags for all three rows. These were standard on Limited trim and optional on all other models, however could not be ordered with the moonroof option. Uconnect Bluetooth phone pairing was now available, as well as an overhead rail storage system with three moveable or removable compartments. Some Town & Country models with the 3.3 L V6 from 1998 to 2003, and all models with the 3.3 L V6 from 2004-2007 can use E85 fuel. For more details on these engines see this article. However, it was noted that "The LHD car performed significantly better than the RHD car in the frontal impact, scoring 9 points, giving a potential four star adult occupant rating." Thatcham's New Car Whiplash Ratings (NCWR) organization tested the 4th generation European Grand Voyager for its ability to protect occupants against whiplash injuries with the car achieving an 'Acceptable' rating overall. Chrysler debuted the 2008 model year Town & Country went on sale on August 16, 2007 as a 2008 model. The short-wheelbase model was discontinued. The minivans featured styling by Ralph Gilles, a six-speed automatic, a new 4.0 L V6 engine as standard on the Limited model — and a system of second row seats that swiveled to face the third row — marketed as Swivel'n Go seating. A small table, which stored in the bins below the floor, could be positioned between the two rear rows when they were facing each other. Much like its competitors, the Toyota Sienna and Honda Odyssey, the Town & Country now featured power windows on the sliding doors and moved the gear shift from the steering column to the center console, in a higher position. Another new feature of this generation was an available rear overhead console which featured LED map lights as well as halo ambient lighting. A new DVD system was also available, which featured dual screens for the rear passengers. SIRIUS Backseat TV was also offered, which featured three channels of children's programming. A version of this vehicle is sold in several export markets (Australia/South Africa/ Middle East/China/Singapore/Russia) as the Chrysler Grand Voyager. In Europe it is known as the Lancia Voyager from the 2011 model year and up. Before 2011 it was sold as a Chrysler. Since 1991, the model has been sold in the Philippines under the Town and Country nameplate. In the European and Filipino markets, it is equipped with a 2.8L turbodiesel engine and 6-speed transmission as standard. Production at the St. Louis plant ended in late 2008 in a bid to save money, but continued at Windsor Assembly in Ontario, Canada. The LX, from 2008-2010, served as the "base" Town & Country trim level. Standard features included a 3.3L V6 engine, a 4-speed automatic transmission, an A/M-F/M stereo with CD player and a 4-speaker sound system, sixteen-inch (16") black-painted steel wheels with plastic wheel covers, stain-repellent cloth seating surfaces, keyless entry, wood interior trim accents, carpeted floor mats, and Chrysler's Stow 'N' Go fold-in-floor seating system. The trim level, which was discontinued after 2010, was reintroduced for 2015, once again as the "base" Town & Country trim level. For 2015, it included a 3.6L "Pentastar" VVT V6 engine, a 6-speed automatic transmission, seventeen-inch (17") alloy wheels, leather-trimmed seating surfaces, a touch-screen sound system, a 6-speaker sound system, power-sliding rear doors and a power tailgate, a rear-seat DVD entertainment system, and a security system. The Touring had been the "midrange" Town & Country trim level since 2008. From 2008 to 2010, it added the following equipment to the base LX trim level: a 3.8L V6 engine, sixteen-inch (16") alloy wheels, an A/M-F/M stereo with CD/MP3 player and a 6-speaker sound system, a security system, second-row bucket seats, power-sliding rear doors and a power tailgate, and power second-row windows and third-row vent windows. Since 2011, it has included the following features (it was the "base" trim level from 2011 to 2014): a 3.6L "Pentastar" VVT V6 engine, a 6-speed automatic transmission, leather-trimmed seating surfaces, a touch-screen sound system, power-sliding rear doors and a power tailgate, power second-row windows and third-row vent windows, and a rear-seat DVD entertainment system. The S was the "sporty" Town & Country trim level since 2014. It added dark-finished alloy wheels, a darkened front grille, darkened front headlamps, and unique leather-trimmed seating surfaces to the midrange Touring trim level. The Touring L was the "upgraded" Town & Country trim level since 2012. It adds heated front bucket seats, a third-row DVD entertainment system screen, and upgraded eighteen-inch (18") alloy wheels to the midrange Touring trim level. The Limited was the top-of-the-line Town & Country trim level from 2008 to 2014. From 2008 to 2010, it added the following features to the midrange Touring trim level: a 4.0L V6 engine, a 6-speed automatic transmission, a touch-screen sound system with rear DVD entertainment system, leather-trimmed seating surfaces, a 9-speaker premium 506-watt surround-sound system with external amplifier and subwoofer, and chrome wheels. From 2011 to 2014, it added the following features to the midrange Touring trim level: a 9-speaker premium 506-watt surround-sound system with external amplifier and subwoofer, and upgraded interior trim. In 2015, the Limited Platinum replaced the Limited as the top-of-the-line Town & Country Trim level, and the standard upgraded premium surround-sound system was dropped from the standard equipment list. The Limited Platinum has been the top-of-the-line Town & Country trim level since 2015. It adds the following features to the Limited trim level: special alloy wheels, upgraded interior trim, and a 9-speaker premium 506-watt surround-sound system with external amplifier and subwoofer. For 2014, a 30th Anniversary Edition Town & Country was available to celebrate the minivan's 30th anniversary (Chrysler invented the term "minivan" in 1984, and the 2014 Dodge Grand Caravan also received special treatment). It added special alloy wheels, special interior trim, and special '30th Anniversary 1984-2014' emblems to the exterior of the van. For 2016, a 90th Anniversary Edition Town & Country was available to celebrate Chrysler's 90th anniversary (the company was founded in 1926). It added special interior trim and special '90th Anniversary Edition 1926-2016' emblems to the exterior of the van. Both the 3.8 L and 4.0 L engines were paired with Chrysler's 62TE 6-speed automatic transmission with variable line pressure (VLP) technology (See Ultradrive#62TE). This transmission is standard with the new (2011 on) 3.6 litre V6 engine. In the NHTSA's New Car Assessment Program crash testing, the 2010 Chrysler Town & Country achieved a five star (top safety) rating in several categories. The 2.8 CRD 163 hp 6-speed automatic drive train was also tested by EcoTest and was given a rating of 45 out of 100 for environmental friendliness and star rating. Beginning with Generation V, Volkswagen began marketing the Routan, a rebadged variant of the Chrysler RT platform minivan with revised styling and content, for the Canadian, American and Mexican markets. The Routan is manufactured at Windsor Assembly alongside the Grand Caravan, debuted in 2008 at the Chicago Auto Show and with sales beginning in autumn of 2008, and features neither Chrysler's Stow'n Go nor Swivel'n Go seating systems, but however, features the Easy Out Roller Seats. On June 3, 2010 Chrysler recalled 284,831 MY 2008 and 2009 Town & Country vehicles due to an improperly routed wiring harness inside the sliding door. A similar recall also affected 15,902 MY 2010 Volkswagen Routan vehicles. The Dodge Grand Caravan and Chrysler Town & Country received mid-cycle refreshes for the 2011 model year. Changes included restyled exterior and interior with all-new wing logo, standard SafetyTec (including Blind Spot Monitoring and Rear Cross Path Detection), improvement to the Stow n Go seating and storage system, a one-touch fold down feature for easier access to the third row, a new super center console and technology, a dual DVD system that can play different media at the same time, SIRIUS Backseat TV which offers three channels of childrens programming, FLO TV featuring 20 channels of live programming, Pentastar V6 (283 hp) engine replacing previous 3.8-liter and 3.3-liter V-6 engines, six-speed automatic transmission, a new fuel economizer mode, a new instrument panel and instrument cluster, new Chrysler Brand steering wheel with integrated controls that allow the driver to operate the radio, cruise control, hands-free phone and other vehicle functions while keeping their hands on the wheel; upgraded cloth and leather seating materials; new soft touch door trim, new heating and cooling control system. Other changes included retuned suspension with a larger front sway bar and new rear sway bar, increased rear roll center height, new spring rates, new steering gear, new front static camber setting, and lowered ride height; extra sound insulation, acoustic glass, new LED ambient lighting and center console, and new fog lights. Canada models arrived in dealerships in the fourth quarter 2010. The 2011 Chrysler Town & Country minivan was built at Chrysler Group LLC's Windsor Assembly Plant Windsor, Ontario, Canada starting on October 1, 2010. For 2012, leather seating and a DVD rear-seat entertainment system were made standard on all Town & Country trim levels. Cloth seating remained optional on the Touring trim in Canada, and standard on the Touring trim in Mexico. In Mexico, the "L" suffix on the Touring-L trim stood for leather. The Lancia Voyager is a version of Chrysler Town & Country for European market, as a replacement of Lancia Phedra. Changes include removal of chrome bodyside molding. The vehicle went on sale in October 2011 across Europe. Early Italy model includes Gold trim level, a choice of 2 engines (283 hp 3.6L Pentastar petrol, 163 hp 2.8L diesel), 6-speed automatic transmission, a choice of 4 body colours (Brilliant Black, Carbon Grey, Silver, Stone White), a choice of two interior colours (Black/Grey and Beige), ParkSense assisted parking system with the optional ParkView rear view camera integration, 17" diamond-cut alloy wheels, black roof racks, seats upholstered in high quality leather, audio controls on the steering wheel and gear lever knob, also leather-covered, ESP, 6 airbags, cruise control, fog lights, automatic headlights, active pedestrian protection, automatic three-zone climate control, 6-speaker radio with CD player, U-Connect hands-free system with I-pod/Mp3 system, heated door mirrors, side doors and tailgate with electric control. It remains the Chrysler Grand Voyager in the United Kingdom, Ireland, South Africa, Australia, Asia, and Russia. Changes for the 2013 model year included optional Blu-Ray rear seat dual-screen DVD system, sharper-resolution rear-seat DVD screens for all models, a HDMI input for video game systems, two rear-seat USB ports for charging cell phones or MP3 players, standard Trailer Sway Damping, standard power folding mirrors on Limited and optional on Touring L models, new standard leather seating surfaces on Touring models, a new 17-inch alloy wheel design for Touring L models. Early US models include Chrysler Town & Country Touring, Town & Country Touring L and Town & Country Limited. The Town & Country S was unveiled in 2012 Los Angeles International Auto Show. The model came equipped with a black chrome grille combined with black-background Chrysler Winged badges front and rear, a black rear fascia step pad, 'S' model badging, 17-inch aluminum wheels with polished face and black-painted pockets and blacked-out headlight bezels (delayed availability), Black Torino leather seats with an 'S' logo embroidered in the seat backs and black Ballistic cloth seat inserts, grey stitching at seats and door armrests, Piano Black gloss appliques at the instrument panel and on the spokes of the black leather-wrapped steering wheel, Chrysler Winged badge on the wheel matches the black background-look of the exterior badging, a black headliner and upper consoles, black center console and an 'S' logo in the instrument cluster, dual-screen Blu-Ray DVD system (HDMI input, two USB recharging ports, a 12 V outlet and a 115 V two-prong outlet), a performance suspension, and a choice of 4 body colors (Brilliant Black, Deep Cherry Red, Stone White or Billet Silver). This van was a limited (150 units) version of 2013 Chrysler Town & Country for Mexico market, designed in collaboration with Mexican jewelry designer Tanya Moss. The 2013 Chrysler Town & Country minivan was built at Chrysler Group LLC's Windsor Assembly Plant in Windsor, Ontario, Canada. Daytime running lamps are now a standard feature on US models. Previously, they were only standard on Canadian and European models; US models required dealer activation. The "30th Anniversary Edition" was a modified version of the Touring-L trim, commemorating 30th anniversary of Chrysler Town & Country. This trim level came equipped with 17-inch aluminum wheels with polished faces and painted satin carbon pockets, '30th Anniversary' badging, Black Alcantara seat inserts with Nappa seat bolsters, Piano Black steering wheel bezels and instrument panel trim, third-row power folding seats, touchscreen radio with 30th Anniversary splash screen, 30th Anniversary logo on the key fob, rear back up camera, choice of 8 body colours (exclusive Granite Crystal Pearl Coat, Billet Silver Metallic Clear Coat, Brilliant Black Crystal Pearl Coat, Cashmere Pearl Coat, Deep Cherry Red Pearl Coat, Bright White Clear Coat, True Blue Pearl Coat, Maximum Steel Metallic Clear Coat). The Town & Country S was carried over for the 2014 model year, which included a black chrome grille combined with black-background Chrysler Winged badges front and rear, a black rear fascia step pad, 'S' model badging, 17-inch aluminum wheels with polished face and black-painted pockets and blacked-out headlight bezels, Black Torino leather seats with an 'S' logo embroidered in the seat backs, black Ballistic cloth seat inserts, grey stitching; grey stitching at door armrests, piano black gloss appliques on the instrument panel and on the spokes of the black leather-wrapped steering wheel, Chrysler Winged badge on the wheel matches the black background-look of the exterior badging, a black headliner and upper consoles, black center console, an 'S' logo in the instrument cluster, dual-screen Blu-Ray system (HDMI input, two USB recharging ports, a 12 V outlet and a 115 V two-prong outlet, wireless headphones), and a performance suspension. The 2014 Chrysler Town & Country was available in eight exterior colors: Billet Silver Metallic Clear Coat, Brilliant Black Crystal Clear Coat, Bright White Pearl Coat, Cashmere Pearl Coat, Deep Cherry Crystal Pearl Coat, Maximum Steel Pearl Coat, Mocha Java Pearl Coat, True Blue Pearl Coat and Sapphire Crystal Metallic Clear Coat. 2014 Chrysler Town & Country was built in Chrysler Group LLC's (now FCA US LLC) Windsor Assembly Plant in Windsor, Ontario, Canada. For 2015, the LX model was reintroduced, now nearly identical to the Touring except for the lack of front fog lights and EVIC. Also introduced was a new Premium trim level for the Canadian market, including Alcantara and Nappa Leather faced seats, heated front and 2nd-row seats, and a heated steering wheel as standard equipment. The Limited was succeeded as the highest level trim by the Limited Platinum, which is near identical to the previous Limited save for a few changes. The Limited still continued production, although with a few standard features removed or made optional (such as HID headlamps) due to the Limited Platinum. 2015 Chrysler Town & Country was built in FCA Canada Inc's Windsor Assembly Plant in Windsor, Ontario, Canada. All 2016 models are carryover from the 2015 model year. Projector headlamps are now standard across all trim levels in the US except for fleet vehicles; halogen projector headlamps replaced the reflector headlamps used in previous model years, HID headlamps are optional on Touring-L and Limited, and are standard on Limited Platinum. 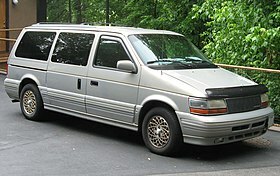 The reflector headlamps are retained on the Dodge Caravan. Last year for the Chrysler Town & Country. The 90th Anniversary Edition is a variant of the Touring-L commemorating the 90th anniversary of the Chrysler company, adding several optional features as standard features including heated second row seats, a heated steering wheel, and a power sunroof. Distinguishing features are special badging, a 90th Anniversary Edition radio splash screen, and special floor mats. This model went on sale alongside the 200 90th Anniversary Edition, based on the 200 Limited, and 300 90th Anniversary Edition based on the 300 Limited. 2016 Chrysler Town & Country was built at FCA Canada Inc's Windsor Assembly Plant in Windsor, Ontario, Canada. 1990-1995 models came in a single unnamed trim level, from hereon referred to as "base." Chrysler has regularly innovated new seating systems for their minivans, to enhance interior flexibility. Introduced in 1990 for the 1991 model year, Chrysler marketed 2nd row "captains chairs" as a substitute to the "partial bench" 2nd row seat. In 1991 introduced a second row bench seat integrating two child booster seats. These seats have continued as an available option through Generation 5. In 1995, Chrysler introduced a system of seats to simplify installation, removal, and re-positioning— marketed as Easy-Out Roller Seats. When installed, the seats are latched to floor-mounted strikers. When unlatched, eight rollers lift each seat, allowing it to be rolled fore and aft. Tracks have locator depressions for rollers, thus enabling simple installation. Ergonomic levers at the seatbacks release the floor latches single-handedly without tools and raise the seats onto the rollers in a single motion. Additionally, seatbacks were designed to fold forward. Seat roller tracks are permanently attached to the floor and seat stanchions are aligned, fascillitating the longitiudinal rolling of the seats. Bench seat stanchions were moved inboard to reduce bending stress in the seat frames, allowing them to be lighter. When configured as two- and three-person benches (available through Generation IV), the Easy Out Roller Seats could be unwieldy. Beginning in 2000, second- and third-row seats became available in a 'quad' configuration — bucket or captain chairs in the second row and a third-row three-person 50/50 split "bench" — with each section weighing under 50 lbs. The Easy-out system remained in use through Generation V — where certain models featured a two-person bench and the under-floor compartments from the Stow'n Go system. The Volkswagen Routan, a rebadged nameplate variant of the Chrysler minivans, used the Easy Out Roller Seats on its second-row seating. These were made available on upper trims the Town and Country after the discontinuation of the Swivel 'n Go seats. In 2005, Chrysler introduced a system of second- and third-row seating that folded completely into under-floor compartments — marketed as Stow 'n Go seating and exclusively available on long-wheelbase models. In a development program costing $400 million, engineers used an erector set to initially help visualize the complex interaction of the design and redesigned underfloor components to accommodate the system — including the spare tire well, fuel tank, exhaust system, parking brake cables, rear climate control lines, and the rear suspension. Even so, the new seating system precluded incorporation of an AWD system, effectively ending that option for the Chrysler minivans. The system in turn creates a combined volume of 12 cubic feet (340 L) of under floor storage when second row seats are deployed. With both rows folded, the vans have a flat load floor and a maximum cargo volume of 160.7 cubic feet (4,550 L). The Stow 'n Go system received Popular Science magazine's "Best of What's New" for 2005 award. The Stow 'n Go system was not offered on the (now discontinued) Volkswagen Routan, a rebadged nameplate variant of the Chrysler minivans. The Stow 'n Go seating and storage system in the Town & Country and Dodge Grand Caravan was improved, revised and renamed "Super Stow 'n Go" for the 2011 model year. This system is still on the Grand Caravan and was adapted for the new Pacifica. Chrysler introduced a seating system in 2008, marketed as Swivel'n Go. In the system, the two second row seats swivel to face the third row. A detachable table can be placed between the second and third row seats. Swivel'n Go is available with Stow 'n Go seating after 2008 models. 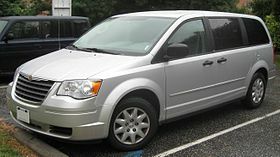 The Swivel 'n Go system is offered on the Dodge Caravan, but not the Volkswagen Routan, a rebadged nameplate variant of the Chrysler minivans. These Swivel 'n Go Seats were manufactured by Intier Corp. a division of Magna. The tracks, risers and swivel mechanisms are assembled by Camslide, a division of Intier. The swivel mechanism was designed by and is produced by Toyo Seat USA Corp. The swivel mechanism includes bumpers that stabilize the seat while in the lock position. When rotated the seat come off these bumpers to allow easy rotation. The seat is not meant to be left in an unlocked position or swiveled with the occupant in it, although this will not damage swivel mechanism. Swivel 'n Go was dropped from the 2011 line of Chrysler and Dodge minivans due to a lack of consumer interest. Chrysler Town & Country and Dodge Grand Caravan minivans with Stow 'n Go & Swivel 'n Go seats are built in Windsor, Ontario. Two plants have had the task of building the Town & Country, with Saint Louis Assembly building it from 1989 to 2001, and Windsor from 2001 to the present. As of May 2006, Windsor Assembly will be the lead producer of the RT, but will not fully take over until 2009 when they phase out current production of the Pacifica (CS). Saint Louis Assembly minivan plant was closed in October 2008 making Windsor the sole producer of the Chrysler Town & Country and Dodge Grand Caravan. Taiwanese-market Town & Country minivans were assembled in Yangmei, Taiwan under license by the China Motor Corporation, starting with the 2006 model year. They are similar to the North American model, with minor variations for the local market. The most obvious difference is the front bumper, taillights, and headlights, which are shared with the European market Chrysler Grand Voyager. In 2007, production ended and the production line was relocated to China where Soueast continued to assemble it under the Chrysler Grand Voyager and Dodge Grand Caravan nameplates from 2008 until late 2010. From 1991 to 2007 Chrysler Voyager/Grand Voyager cars were assembled in Austria and sold out in Europe and in many other global markets. Since 2008 the European-Version is also produced in Ontario, although diesel engines are still available, and the trim is also different. From the outside the cars look very similar to the North American Town & Country Model, but are sold as the Chrysler Grand Voyager. The Town & Country is also marketed in Mexico, Venezuela, and from 2011 on, in Brazil, as it was previously sold there rebadged as the Chrysler Caravan. In September 2008, Chrysler unveiled a plug-in hybrid version of the Town & Country along with similarly engineered 4-door Jeep Wrangler and a purely electric sports car. The Town & Country prototype had an all-electric range of 40-mile (64 km) before gasoline starts. However, in November 2009 Fiat SpA disbanded Chrysler's ENVI electric car division and dropped these models from future product plans. A two-year demonstration program with 25 flexible-fuel plug-in minivans began in April 2012. The first Town and Country were delivered in Auburn Hills, Michigan and Charlotte, North Carolina. The US$26-million demonstration project is partially financed by a US$10 million grant from the U.S. Department of Energy (DOE). The plug-in hybrid minivans are equipped with an E85-compatible 3.6-liter Pentastar engine mated to a front-wheel-drive, with two-mode hybrid transmission. The plug-in hybrid is powered by a liquid-cooled 12.1 KWh lithium-ion battery that delivers a total output of 290 horsepower. The total vehicle range is 700 mi (1,100 km). A plug-in hybrid version of the next-generation Chrysler minivan launched in the U.S. in late 2016. In September 2012 Chrysler temporarily suspended the demonstration program. All 109 Dodge Ram 1500 Plug-in Hybrids and 23 Chrysler Town & Country plug-in hybrids deployed by the program were recalled due to damage sustained by three separate pickup trucks when their 12.9 kWh battery packs overheated. The carmaker plans to upgrade the battery packs with cells that use a different lithium-ion chemistry before the vehicles go back on service. Chrysler explained that no one was injured from any of the incidents, and the vehicles were not occupied at the time, nor any of the minivans were involved in any incident, but they were withdrawn as a precaution. The demonstration is a program jointly funded by Chrysler and the U.S. Department of Energy that includes the first-ever factory-produced vehicles capable of reverse power flow. The experimental system would allow fleet operators to use their plug-in hybrids to supply electricity for a building during a power outage, reduce power usage when electric rates are high or even sell electricity back to their utility company. The company reported that the demonstration fleet had collectively accumulated 1.3 million miles (2.1 million km) before the vehicles were recalled. Chrysler also reported that the plug-in pickups delivered peak average fuel economy of 37.4 mpg‑US (6.29 L/100 km; 44.9 mpg‑imp), while the plug-in hybrid minivans delivered 55.0 mpg‑US (4.28 L/100 km; 66.1 mpg‑imp). ^ "Chrysler LLC Celebrates 25th Anniversary of the Minivan". Autonew24h.com. Retrieved 27 January 2014. ^ "Can 2017 Pacifica minivan re-energize Chrysler?". Detroit Free Press. Retrieved 2016-01-11. ^ Priddle, Alisa (December 5, 2015). "2017 Chrysler minivan coming; Dodge not leaving yet". Detroit Free Press. Retrieved December 16, 2015. ^ Early sales material for the model referring to it as a 1989 model, retrieved on 2014-12-13. ^ "1990 Chrysler Showroom Brochure" pg. 20-21, retrieved on 2011–06–18. ^ "1990 Chrysler Showroom Brochure" pg. 30, retrieved on 2011–06–18. ^ "Fuel Economy of the 1989 Chrysler Town and Country", retrieved on 2015-04-17. ^ Wilson, Gerard (June 2013). "Chrysler Cars and Production Numbers, United States". Allpar. Retrieved March 6, 2016. ^ "NewsLibrary.com - newspaper archive, clipping service - newspapers and other news sources". Nl.newsbank.com. 1991-01-18. Retrieved 2012-01-13. ^ Yates, Brock (1996). The Critical Path: Inventing an Automobile and Reinventing a Corporation "Showtime in St.Louis" p.210. Little, Brown. ^ a b c "2001-2004 Chrysler Town & Country" Archived October 20, 2010, at the Wayback Machine, retrieved on 2011–08–22. ^ "2002 Chrysler Town & Country", retrieved on 2011–08–22. ^ "2005 Chrysler Town & Country" Archived July 30, 2011, at the Wayback Machine, retrieved on 2011–08–22. ^ a b "For safer cars | Chrysler Voyager". Euro NCAP. Retrieved 2010-03-15. ^ "Safety | New Car Whiplash Ratings | Car Search | Thatcham MIRRC". Thatcham.org. Archived from the original on July 28, 2011. Retrieved 2011-08-08. ^ "New Vehicle Security Ratings | Car Search | Car Results | Thatcham MIRRC". Thatcham.org. Archived from the original on August 2, 2011. Retrieved 2011-08-08. ^ Volkmann, Kelsey (2009-05-06). "Chrysler to close Fenton truck plant by September". ^ "Chrysler Group LLC Celebrates Production Launch of the New 2011 Dodge Grand Caravan and Chrysler Town & Country at Windsor (Canada) Assembly Plant" (Press release). Chrysler Group LLC. 18 January 2011. Retrieved 7 April 2015. ^ a b c "Preliminary Specifications (North America)" (PDF). Archived from the original (PDF) on March 20, 2009. Retrieved 2009-09-26. ^ "Chrysler Pentastars Engines - Specifications". Pentastars. Retrieved March 6, 2016. ^ "Portal for 2010 Chrysler minivan US NCAP safety ratings". NHTSA www.Safercar.gov. Archived from the original on May 22, 2010. Retrieved June 23, 2010. ^ "2016 Chrysler Town & Country". IIHS. Retrieved 2018-10-24. 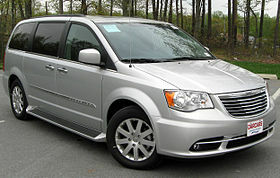 ^ "New 2011 Chrysler Town & Country: Exquisite Innovation Drives Families Safely to Their Destination". Chrysler (Press release). September 14, 2010. Retrieved March 6, 2016. ^ "2012 Chrysler Town & Country". Edmunds.com. Retrieved 2012-01-01. ^ Sabatini, Jeff (20 October 2011). "How do you say "Chrysler minivan" in Italian? "Lancia Voyager"". Autoblog.com. Retrieved 26 July 2015. ^ "2013 Chrysler Town & Country Raises The Bar Again In The Minivan Segment". Chrysler (Press release). September 1, 2012. Retrieved March 6, 2016. ^ "Chrysler Town & Country S Joins the "S" Family of Chrysler Models and Brings Cool, Modern Design to the Minivan". Chrysler (Press release). November 26, 2012. Retrieved March 6, 2016. ^ "Intro to Designer Tanya Moss". Focusofnewyork.com. 20 June 2013. Retrieved 26 July 2015. ^ "Chrysler Town & Country 30th Anniversary Edition". Blog.chrysler.com. 3 September 2013. Retrieved 26 July 2015. ^ Ramey, Jay (2 September 2013). "Chrysler to release 30th Anniversary Edition minivans". Autoweek.com. Archived from the original on February 23, 2014. Retrieved 26 July 2015. ^ "2014 Town & Country" (PDF). Retrieved 26 July 2015. ^ "2014 Chrysler Town & Country Features 30th Anniversary Edition and "S" Model". Chrysler (Press release). September 1, 2013. Retrieved March 6, 2016. ^ "Total Chrysler LLC December 2007 Sales Up 1 Percent on the Strength of Retail". CheersandGears.com. 2008-01-03. Retrieved 2009-01-05. ^ Oldsmoboi (2009-11-04). "December 2010 Sales: Chrysler - Cheers & Gears Forums". Cheersandgears.com. Retrieved 2011-01-04. ^ "Chrysler Sales Shoot Up 37% (26% for 2011)". Allpar.com. 2012-01-04. Retrieved 2012-01-04. ^ "Chrysler Canada Finishes Year With Best Sales Since 2000". Chrysler (Press release). January 3, 2014. Retrieved March 6, 2016. ^ "FCA US LLC Reports December 2014 U.S. Sales Increased 20 Percent" (PDF) (Press release). FCA US LLC. 2015-01-05. Retrieved 2015-01-07. ^ a b "Chrysler extends leadership in Mideast minivan segment with 'Stow 'n Go'". Ameinfo.com. Archived from the original on March 25, 2013. ^ a b Chrysler. "Chrysler Group Brings Minivan Segment's Only Stow 'n Go Seating And Storage System to Market in Just 18 Months". PR Newswire (Press release). Retrieved March 6, 2016. ^ "Stow 'n Go Minivan Technology Awarded Popular Science Magazine's "Best of What's New" for 2005". Autointell.com. 17 November 2004. Retrieved March 6, 2016. ^ "Swivel 'n . . . gone". Automotive News. 29 November 2010. Retrieved 27 January 2014. ^ Martinez, James (September 23, 2008). "Chrysler minivan plug-in hybrid promises 40 mile electric only range". Motor Authority. Retrieved May 14, 2018. ^ Kevin Krolicki (2009-11-06). "Chrysler dismantles electric car plans under Fiat". Reuters. Retrieved 2009-11-17. ^ King, Danny (18 April 2012). "Chrysler delivers first plug-in minivans in $26m demonstration project". Autoblog Green. Retrieved 27 January 2013. ^ Roush, Matt (18 April 2012). "Chrysler Group Sends More Plug-In Hybrid Chrysler Minivans To Duke Energy". CBS Detroit. Retrieved 27 January 2013. ^ Larry P. Vellequette (2014-10-06). "Hybrid Chrysler minivan will hit market in '15, a year early". Automotive News. Retrieved 2014-11-16. ^ a b Voelcker, John (24 September 2012). "Chrysler Yanks Plug-In Hybrid Test Fleet Off Roads, Will Replace Batteries". Green Car Reports. Retrieved 27 January 2013. "Generations: Chrysler, Dodge and Plymouth Minivans". Edmunds.com. Archived from the original on August 31, 2005. Retrieved January 3, 2006. "Chrysler Alternative Fuel Vehicles Line-Up". Chrysler.com. Archived from the original on March 16, 2006. Retrieved April 4, 2006. "E85 Vehicles -- Daimler Chrysler". National Ethanol Vehicle Corporation www.e85fuel.com. Archived from the original on December 30, 2005. Retrieved January 3, 2006. "Portal for 2010 Chrysler minivan US NCAP safety ratings". NHTSA www.Safercar.gov. Archived from the original on May 22, 2010. Retrieved June 23, 2010. Wikimedia Commons has media related to Chrysler Town & Country.